A beta version of Windows 10 now includes support for a pass-through video mode for Windows VR headsets, allowing users to look out at the world around them through the headset’s on-board cameras. This week Microsoft released Windows 10 Insider Preview Build 17723 to users who are part of the Windows Insider Program. The update includes a new feature for Windows VR headsets called ‘Mixed Reality Flashlight’. 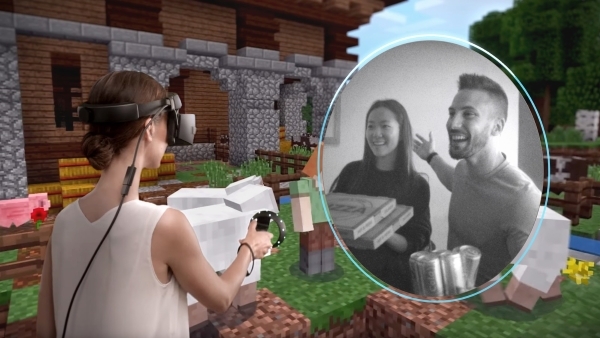 Activated either through a voice command or a controller shortcut, the Mixed Reality Flashlight makes two circular video windows into the real world appear before the user; each window is positioned based on where the user is pointing their controller. The video seen through the windows comes from the headset’s on-board cameras, which have up until this point been reserved solely for inside-out tracking. The HTC Vive and Vive Pro have a similar function, though it goes widely unused, likely due to the ‘tron mode’ filter which is applied by default and low resolution. Seen in action in a video by YouTuber ‘NXTwoThou’ [in the original story] (loud volume warning), the pass-through video is monochrome, likely because the cameras on the headset don’t have any color sensors (in order to devote as much of the camera sensor as possible to resolution and dynamic range which is important for the inside-out tracking). Microsoft says the video portals are “low-latency,” but doesn’t offer more detail. It isn’t clear why they decided to show only a small portion of the view at once, and to attach the position of the view to the controller instead of directly to the user’s head. It could be explained by not wanting the user to easily see the entire edge of the video feed at once (which could be cropped smaller than headset’s full field of view). So far Microsoft hasn’t said anything about being able to use the video feed for augmented reality purposes, something that HTC has begun experimenting with on the Vive Pro. Pass-through video is a convenient way to find your headphones, controllers, etc without removing the headset. While almost all of the Windows VR headsets have a handy flip-up visor which lets you easily take a quick peek into the real world, the Samsung Odyssey will surely enjoy the Mixed Reality Flashlight feature as it lacks the flip-up visor. If you want to preview the update you can join the Windows Insider Program to update to Build 17723, otherwise you’ll get the update later when it launches widely through Windows Update.